The formation of tall buildings dates back to the days of the Great Pyramid, where three pyramids were built in the honor of the pharaohs. These pyramids remained the largest structures in the world and, controversially, some of the oddest shaped structures in the world. However, since the 1800’s skyscrapers were being built around the world. As one structure was built in a country, another was already trying to surpass it. In lieu of this, many towers have been built and have surpassed the Great Pyramids by exceptional rates. The Great Pyramid of Giza was built in 2550 B.C. in El Giza, Egypt in honor of the pharaoh Khufu and his three wives, which were all placed inside the pyramid. Sectioned out, the pyramid has a “King’s room” where the pharaoh was left to lie with his riches. There is also subsections for his wives, where they all have their own rooms known as the “Queen’s Room” which holds their remains and riches. The construction of the Great Pyramid of Giza took years of hard work and would accumulate approximately $5 billion worth of work today. The pyramid stands the tallest of the three, standing around 455 feet tall. Pyramids of Giza Panorama, by Sebastian Schulz. Image licensed via Creative Commons Attribution-NonCommercial-ShareAlike 2.0 license. Setting all new limits, America set all new standards for the tallest building in the world. The Empire State Building in New York City was constructed in 1931. The Empire State Building stands 1,451-feet tall as the tallest building in NYC right now, since the destruction of the twin towers in 2001. However, the construction of the One World Trade Center, the Empire State Building will once again be surpassed in New York City. 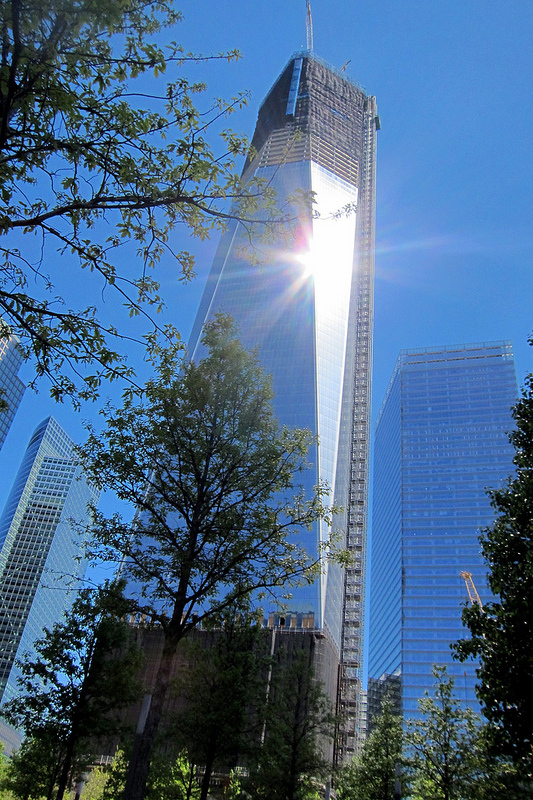 The One World Trade Center will stand 1,792 feet tall from bottom to tip and will be opened in early 2014. NYC – FiDi: One World Trade Center (under construction), by Wally Gobetz. Image licensed under Creative Commons Attribution-NonCommercial-NoDerivs 2.0 license. The largest building in America until the One World Trade Center opens, however, is the Willis Tower, which was built in 1973, and stands 1,729 feet. The Willis Tower is located in Chicago, Illinois and remained the tallest building in the world until 2010 when it was surpassed by the Burj Khalifia in Dubai. These buildings remain some of the most iconic buildings in the world. However, not just due to their height, but also because of their structural designs which all differentiate greatly. Even so, they all contain one similar attribute – the peaks. From the triangle shape of the Great Pyramid to the updated structure of the Burj Khalifia, it is common for larger buildings to “tipoff” at the top. Structurally and scientifically, these buildings rely on their structural designs to avoid an unsteady foundation – which can be the cause of it falling from harsh winds to a natural disaster. The scientific aspect of architecture creates an elaborate design that even the Egyptians knew of many years before modern science identified it. Prospected that taller buildings will be built throughout the upcoming years, after the completion of the Sky City in China, it is foreseeable that the tip of each building will premiere the same silhouette, favoring that of a triangle. Science has forged a way for us to make tall structures sound without much repercussions. In addition to the Silk Road that connected the East and the West in antiquity, the great Chinese mariner Zheng He (鄭和) also pioneered the “Maritime Silk Road” that acted as a link between China and Africa in the Ming dynasty (1368-1644). The starting point of this route was Nanjing, China, where there are shipyard relics surviving through hundreds of years. 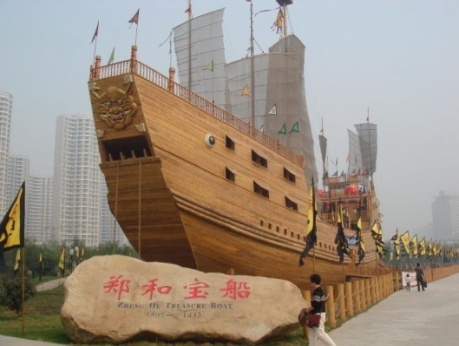 In July, 2005, the Treasure Shipyard Relics Park had been built on the basis of three extant shipbuilding docks through the joint efforts of archaeologists and local government, enabling modern people to get a glimpse of the forepassed magnificent spectacle. On 11 July, 1405, Zheng He started his first of seven voyages by leading a royal fleet of hundreds of gigantic ships which carried as many as around 28,000 followers. His large fleet departed from the Treasure Shipyard, Longjiang (today’s Xiaguan district in Nanjing), sailing for the Western Pacific countries. During the following 28 years Zheng He dedicated the rest of his life to marine navigation until he died on the return journey in 1433, aged 62. Unfortunately, the Great Ming Empire permanently banned such government-sponsored navigation activities subsequent to the time when the brave crewmen arrived in Nanjing and completed the final voyage on 22 July, 1433. Meanwhile, the Treasure Shipyard, which was the world’s largest shipyard at that time (specifically constructed to build ships for Zheng He’s voyages), was soon shut down and abandoned. Thereafter the seafaring enterprise declined drastically in imperial China together with the shipbuilding industry. However, the true purpose of these voyages and the reason why the government totally banned shipping are still wrapped in profound mystery. In academic circles of Chinese history, there are several theories about their true purpose: 1) the emperor in Zheng He’s time could not wait to kill his brother’s son who was thought to be taking refuge abroad and becoming a threat to his throne; 2) the emperor intended to avert the invasion of overseas countries, because the empire was occupied battling against the Mongolians in northwestern China; 3) the proud emperor was eager to flaunt his empire’s prosperity; 4) the emperor wanted to promote trade with overseas countries. Nevertheless, none of the above opinions is convincing, because: 1) sending such a large fleet in search of an escaped person is not an effective way; 2) the overseas countries in Zheng He’s time were not strong enough to invade China; 3) did the emperor have to spend his vast fortune on seven epic voyages to flaunt his empire’s prosperity? 4) if the emperor attempted to promote trade with overseas countries, why didn’t the huge ships carry more goods instead of so many people? The answer is likely to remain a mystery. Many of the documents about Zheng He and his voyages preserved in the imperial palace were found to have been destroyed when one of the later emperors of the Ming dynasty attempted to discover more about Zheng He. The Treasure Ship Model (1:1), by Di Lu. Zheng He’s hometown was Kunming, but his followers buried him in Nanjing. 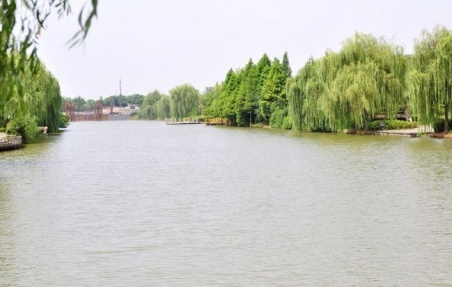 He would never have thought of the fact that bronze statue of him is sited at the place where he began his life at sea, although the area of the Relics Park is approximately only one fifth of the area of the original shipyard, covering an area of 130,000 square meters. As one passes through the10.82-meter high and 16.52-meter wide decorated archway, the Zheng He Bronze Bell comes into his sight. The huge bell is placed at the centre of the Museum square in memory of Zheng He, standing 1.6 meters and weighing 650 kilograms. In front of the square lay three extant shipbuilding docks, whilst on the left and the right sides of the square, there are the Unearthed Relics Museum and the Watch Station respectively. According to archaeological reports, the shipbuilding docks were 421 meters in length, 41 meters in width, and 6 meters in depth. During Zheng He’s time, when work on a ship had been completed, the sluice gate would be opened in order to allow the water in Yangtze River (the third-longest river in the world) to flood in. Then, the ship would be gradually lifted up and pulled away from the dock. By studying the historical records as well as the unearthed remains of the ships, it is estimated that the largest ships built in this site were about 125 meters in length, 51 meters in width, and 12 meters in depth, displacing 17,708 tons. Such a huge ship was believed to be capable of holding over 1000 people. To avoid sinking, the space under the deck was separated into over ten airtight sections by thick wooden boards; to survive collisions, the deck and the bottom of the ship were designed to be as thick as 38 and 34 centimetres respectively; to guarantee the daylighting, the wood window grilles were inlaid with mussel shells polished to 0.1 millimetre in thickness; to ensure quality, each piece of wood was carved with the principal’s name and the time when it was transported here. Seafaring enterprise declined in the East, and only later on did explorers such as Christopher Columbus, Vasco da Gama Ferdinand Magellan pioneer the navigation and expedition from the West. To some extent, the Treasure Shipyard Relics Park not only provides a place to review the ancient Chinese maritime enterprise, but also stimulates us to rethink the relationship between national policies and the development of science and technology in history. Louise Levalhes, When China Ruled the Seas——The Treasure Fleet of the Dragon Thorne 1405-1433 (Oxford University Press, 1994). Gavin Menzies, 1421: The Year China Discovered the World (Bantam Press, 2002).